Grades K – 2 may use “Reading Suggestions for Littles,” found at the top of each Cool History for Littles assignment page, to decide which sections of the Companion to read. K – 2 students may also enjoy coloring a page from the Coloring Book, perhaps while you are teaching your older students. Grades 2 – 7 may read whatever sections of the Companion their parents choose for them. Grades 7 – 12 may read the entire Companion independently. Also assign the corresponding Cool History and Hands-on Map pages for each week. Check your students’ work, assigning grades if you like. Review the chapter, making sure your students understand and remember what they’ve read. Draw your students out, challenging them to think more deeply— especially about the spiritual implications of what they’ve learned. Cut out the Timeline figures for the week and paste them into your flowchart. Choose a fun craft, food or game from the Craft Book to liven up your lessons. Research and record one or more pages in your Hands-On Notebooking project book. The instructions above represent the basics. 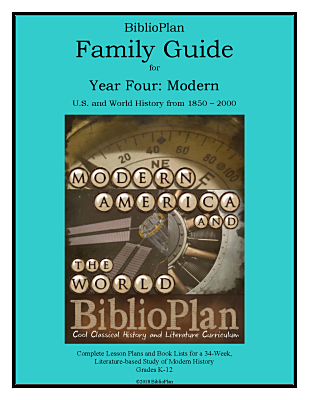 To get the most out of BiblioPlan, parents and teachers must delve into the Family Guide as follows. The Companion and Remember the Days are complete enough to stand alone. Even so, some parents and teachers may wish to add other spines, especially when cycling around a 2nd and 3rd time. For those parents and teachers, the Family Guide lists optional readings from The Story of the World, A History of US, Trial and Triumph, The Mystery of History and other spines. The reading assignment pages in the Family Guide list which chapters from each optional spine go with which week. For example, if BP Year Two, Week 28 is “The Renaissance in Art,” and The Story of the World has a chapter on Renaissance art, then that chapter will appear on the reading assignment page for Week 28. BP does not recommend using every book on the Optional Spine reading list. That would be far too much reading for most! Instead, parents and teachers should choose the optional spine or spines that best fit their specific needs, based on their students’ interests, reading levels and the amount of reading they can handle. For each week of study, and for all ages, BP recommends plenty of history and literature reading options to fit the topic of the week. If we can’t find quality books to fit the topic perfectly, then we recommend books that describe the country or time period under study. Peruse the Annotated Book List for each unit, choosing which resources fit your situation best. Highlight your choices on the Scheduled Book Lists. You now have a wish list that you can carry with you to your library and/or bookstore, or use online. For our customers’ convenience, our website provides links to most of our recommended books on either amazon.com or christianbook.com (Christian Book Distributors). To use these lists, simply click on “Buy BP Recommended Books” above. The number of books you choose is totally dependent on your situation. Voracious readers may devour two or more extra books per week; while reluctant readers may struggle to finish two per unit. Aim for a workload that will challenge your students without pushing them too hard. Just because a student is reading at a certain grade level doesn’t mean that he or she is restricted to that level! Students tend to stay more engaged if they are given a wide variety of books to read on different levels. Feel free to choose the books that interest your student most, even if they are on the easier lists. The books for younger readers may be just as history-rich as the ones for older readers. Parents and teachers know best what their students are capable of reading. Many of our K – 2 selections are picture books that you will probably read aloud to your students. Most of our 3+ selections are books that third graders can read independently, with perhaps a bit of help. These selections often make perfect read-alouds for grades K – 2. For this reason, parents and teachers with children from both of these grade levels often buy the 3+ books to use for both. The reading assignment pages divide longer books, ones that should be read over the course of two or more weeks, by either page numbers or sections. BP recommends that advanced students read at least one literary classic per unit. To get the most out of these classics, we recommend choosing at least some that are accompanied by study guides. A good study guide can (1) help your students understand the literature, (2) help you evaluate your students’ comprehension, (3) spark fruitful discussions, and (4) boost your student's vocabulary. Most of the study guides include vocabulary activities. Classics with study guides appear in the Annotated Book Lists for each unit. For example, one of the High School Literature selections for Year Four, Unit One is The Red Badge of Courage by Stephen Crane, and the accompanying guide is The Red Badge of Courage Progeny Press Study Guide by Gregory Power. BP occasionally recommends out-of-print books that we particularly like. If you can’t find used copies on amazon.com, then they may be available in your library, or through an inter-library loan. Young Writers (grades K – 2) write brief summaries of some portion of their readings, or copy one of their readings, with help from parents and teachers. Grammar Stage writers (grades 2 – 4) answer simple questions, write summaries or take dictation, on their own or with help from parents and teachers. Logic Stage writers (grades 4/5+) answer deeper questions designed to promote synthesis and comparison skills. The fourth writing assignment appears in Cool History for Advanced. Rhetoric Stage writers (grades 7 – 12) may research and write the optional Research Essays from the end of each Cool History for Advanced assignment. Because Scripture is so important, every reading assignment page for every year suggests one or more Bible reading assignments. BP recommends a simple Beginner’s Bible for the youngest students. For students in grades 2 – 8, we suggest that teachers and parents select a portion of the Bible reading assignment for their students to read from the translation of their choice. For older students, we recommend reading the entire assignment. Each new unit begins with a list of memory work options. Some of our selections come from the Bible, and some from classic prose or poetry. Others are lists based on the history or geography in the Companion, such as kings of Judah, seas of the Mediterranean or English monarchs of the House of Tudor. BP does not recommend memorizing everything on these lists! Instead, we recommend choosing one or more memory topics based on your students’ ages and interests. Our Read-aloud schedule covers roughly 50 pages per week. Try to spread out the readings so that you don’t have to cover too many pages on any one night. If Mom normally handles most of the home schooling duties, then let Dad or an older sibling read aloud. If your family includes children too young to follow the reading, then find special activities for them that you pull out only for your evening read-aloud time. Beyond books, BP also suggests optional resources like crafts, audio books and movies. Many movies are available through subscription services like Netflix or Amazon Video. For BP users who also follow Veritas and Classical Conversations, we list the appropriate cards to go along with each week of BP. Like any powerful tool, BP requires a certain amount of caution. To make our Family Guide as versatile as possible, we have provided a great many spine, history and literature reading options. No one family or school should choose all of these options! To do so would be to overwhelm your students, and possibly make them dread history. Instead, each family or school should choose a limited set of options that best suits its needs. It is true that students must read and write extensively if they are to learn their history well. It is also true that students may rebel against teachers who demand too much. Especially with younger students, try to do something fun every week— every day if possible! Break up your reading times and writing assignments with fun discussions, crafts and/or notebooking work. If studying history becomes a chore, then you may be trying to do too much.